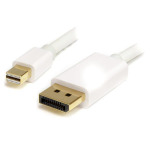 The MDP2DPMM1MW 1m White Mini DisplayPortâ„¢ to DisplayPort Adapter Cable, features a Mini DP male connector on one end, and a DP male connector on the other, allowing you to connect any Mini DisplayPort-equipped laptop (including the MacÂ® family of products) to an HDTV, monitor or projector that uses a standard DisplayPort connection. The MDP2DPMM1MW is backed by StarTech.comâ€™s Lifetime Warranty, for guaranteed reliability and ensures that digitally protected content is displayed properly, with both HDCP and DPCP capability. Please Note: Newer laptop and desktop computers (e.g. AppleÂ®) come equipped with Thunderboltâ„¢ ports only. Our Mini DP to DP Cables can be connected to the Thunderbolt ports, enabling you to connect your DP compatible displays.